In January of this year, I posted my goals for the year, here. I did not say resolutions because that seems to imply binary, yes or no. You either did it or not. Resolution doesn't need to be binary but that seems to have become the norm. So in my post I called them targets. So let's review them to see how we did. My next target is to reach 140 pounds by the end of 2015. This morning I weighed 138.6. So this goal is can be marked down as achieved. I in fact reached this goal back in November but gained a little over the start of winter break. So I had to lose some extra weight these last few days. That fact, or more importantly the causation of it, will become important to remember when I create my goals and intentions for next year. "Continue to do as much yoga as I can without burning out or going bankrupt"
I am not yet bankrupt and I have donea lot of yoga. In fact, I have been keeping track of how many hours of yoga I have done since September. It is over 120 hours, including private/home and short practices, so I am marking this one down as achieved. "Complete as may 5Ks as I can this year to get the 20K challenge wear from Hyland"
Another one achieved. See picture. 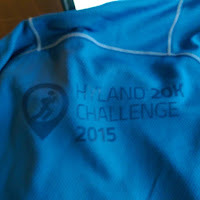 In addition to doing as many 5Ks to get the Hyland 20K Challenge jacket (for the first time), I did various types of running at Yogination (now CleFIT) including 5k runs, suicides, hill sprints. I took Tim's class and it hurt to walk for almost a week. I will take it again at some point but not until I am done with YTT. So this one can also be considered completed achieved. "Continue to be #plantstrong -ish." This target was most definitely achieved due to my addition of "-ish". To my knowledge I have not had meat. I have had dairy a couple of times over the year due to 1)it was the only option for cereal or 2) chocolate. Also I have almost completely removed extracted oils from my diet. I cannot always control this but I try as best I can. In particular, restaurants generally use oil which is lucky I don't go out that often and even some vegan foods have oil. I participated in a Engine 2 Seven Day Rescue program where I lost 4 pounds (that helped my achieve my 140 target) and dropped my total cholesterol to 109! I would say, accordingly, that it was 90% achieved which is good enough for me. I don't have to be perfect. Or rather I can't be perfect, I'm human. Hence the "-ish" in the goal. My intention is to continue to garden in my 12 by 12 foot garden but to expand by adding a 40' by 40' garden as well. Due to the size that may take more than one year. Major crash and burn. Didn't even get close to this one. However it was a conscious decision not to do this one as my year took a completely different turn. I will describe this in more detail in just a bit. This goal has not gone away just postponed. This item is wide ranging...The intention of this item is to learn something and then apply it to my life...This intention is not limited to "work" though. If, for example, my pursuit of improving my yoga I am taken down (shudder) spiritual paths...My intention is to be open to whatever it takes to improve my practice, or work, or relationships. I would consider this a work in progress, achieved but still a work in progress. In fact it probably should always be a work in progress. So at work we continued to read books which included Why Plans Fail, 7 Habits of Highly Effective People, and The Lean Start Up. The biggest thing is that I decided to enroll in a Yoga Teacher Training program. This decision is the main reason why I did not pursue building my garden out as I decided for both time and money reasons to focus on Yoga. More importantly I chose Marni Task as my teacher. I chose her for several reasons one being the influence of John Plagens of 3 Sisters Yoga + Fitness and Jenny Eden. Of course, the seed and ongoing nudging towards this decision was kindly provided by Colleen Alber. I also chose Marni because I simply adore her as a teacher. I really, really enjoy her classes. The main reason though is that Marni's teaching has a very strong spiritual side to it which is significantly outside my comfort zone. In fact, Marni and I had a conversation on that topic specifically. As part of this YTT (Yoga Teacher Training) I have read the Yoga Sutras, the Bhavagad Gita, started the Upanishads and I have started meditating. The meditation has been inconsistent so far. As part of YTT I have taken 20 hours of anatomy classes and now know more about my body, or bodies in general, than I ever had. Regardless, all of these things meets the spirit of this particular target. I would consider that to be a very successful year in terms of living my intentions. This review will provide the basis for 2016 and my intentions for the upcoming year. I should be posting those over the next couple of days. Or that's the plan anyway.